A new raptorial dinosaur fossil with remarkably long feathers has unveiled exciting insights into dinosaur flight, especially that of larger winged dinosaurs. 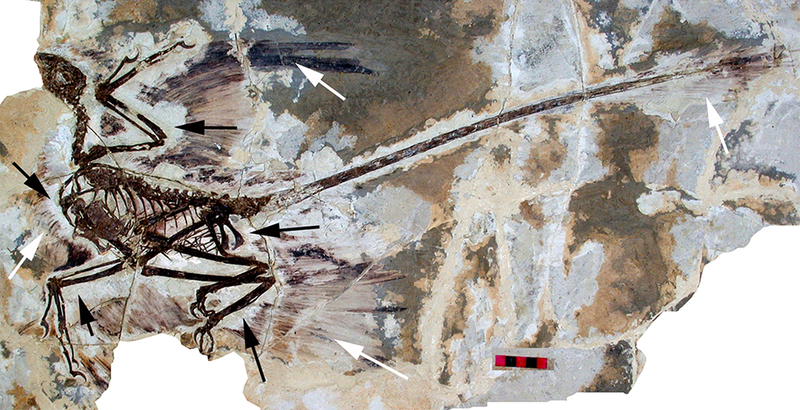 An article published in Nature Communications on July 15, 2014 asserts that the fossil- discovered by an international team led by Natural History Museum of Los Angeles County (NHN) palaeontologist Dr. Luis Chiappe- has a long feathered tail that Chiappe and co-authors believe was vital for decreasing descent speed and assuring safe landings. The 125-million-year-old dinosaur, which has been named Changyuraptor yangi, was discovered in the Liaoning Province of northeastern China. This particular location has seen a substantial increase of discoveries in feathered dinosaurs over the last decade. The newly discovered, remarkably preserved dinosaur boasts a full set of feathers cloaking the entirety of its body, including extra-long tail feathers. “At a foot in length, the amazing tail feathers of Changyuraptor are by far the longest of any feathered dinosaur”, said Chiappe. However, how well these creatures used the sky as a thoroughfare has remained controversial. The new discovery explains the role the tail feathers undertook during flight control. For larger flyers, safe landings are of particular importance. “It makes sense that the largest microraptorines had especially large tail feathers- they would have needed the additional control”, added Dr. Michael Habib, a researcher from the University of Southern California and co-author of the paper.